Makhan Chor is another famous name of Lord Krishna. In Braj region, including Mathura and Vrindavan, it is as famous as Laddu Gopal. Both Makhan Chor and Laddu Gopal represent toddler form of Lord Krishna when as an infant He started crawling on both legs. Bal Gopal, another common name to refer infant Lord Krishna, can mean either Makhan Chor or Laddu Gopal. While Laddu Gopal representation is widely used for worshipping Lord Krishna, Makhan Chor representation is used for admiration, for decorating personal spaces and as a gift to loved ones. Usually, Makhan Chor representation of Lord Krishna shows Him with a tilted Handi full of Makkhan. In this form Lord Krishna is shown as devouring kid, spilling and dribbling Makhan all over the place. Handi is nothing but earthen pot and Makkhan is home-made butter. In another representation of Makhan Chor, a slightly grown up Krishna is shown with His troop, forming human pyramid to steal the butter from the Handi which is hanging from the ceiling. However this representation of Makhan Chor is mostly seen in art work on canvas. 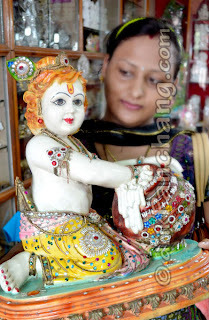 The statues of Lords Krishna in the form of Makhan Chor are in high demand during Krishna Janmashtami.